Browns fans have the biggest say in this decision, not the front office. Instead of giving it their own thoughts...think of how the Cleveland fans feel! I'm sick and tired of hearing the name Brandon Weeden and I know all NFL fans feel the same way. 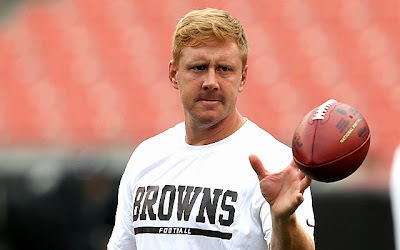 Whether its ranting videos, Facebook pages, or petitions before game day its all centered around the same thing...Cleveland Browns fans hate Brand Weeden and want him gone from the franchise. I don't blame them because what it comes down to in the NFL is winning games and that is something the already aging quarterback simply cant do. Whether its a lazy play, an overthrow, or just a silly turnover in general the thoughts of the now 30 year old have clearly plumeted this season. To be honest nobody was expecting this guy to be great coming out of the draft. When the Browns decided to select a 29 year old quarterback with their only first round pick it truly raised many heads...looking back at that pick now it really is just a shame. Nick Foles is now a member of the 2013 NFC East division champion team. Foles threw 27 touchdowns this year with just two picks! 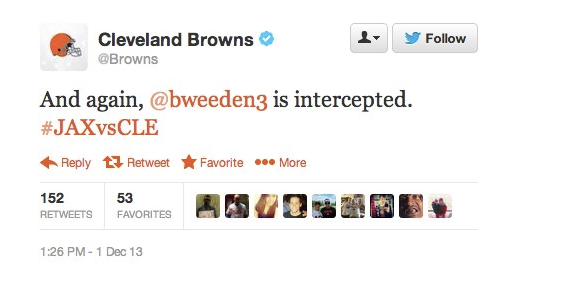 And how far back was he picked from weeden in the 2012 draft? 66 picks. Rusell Wilson...now a member of the top seed NFC team going into the playoffs and also a division winner who has made the playoffs already in his young career! How far back was he picked from Weeden in this 2012 draft? 53 picks! What the heck did the Browns front office see in this guy? They passed up on two young guns poised for future success, and then got an already old turnover machine. Its a pure disgrace that this guy has even remotely represented the storied Cleveland franchise. 5 times Weeden started this season for the Browns...and 5 times a big fat "L" was the outcome. He lost his starting job twice this season and it should have only been one time, in the preseason. This guy should have never stepped in as the starter because he was horrendous from the start. Not to mention he cant keep a halftime lead. 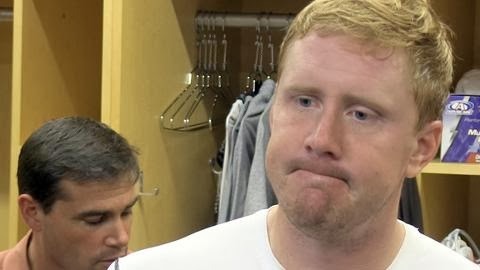 Weeden recently says he has gained great adversity from his experiences this season and he still has the ability to play at the starting spot, but the Browns shouldn't make the decision to bring him back. Terminate that mans contract...immediately. -Get out of town Brandon!